Did you get bored this week? Without worrying about who to surprise with a Cubacel top up? 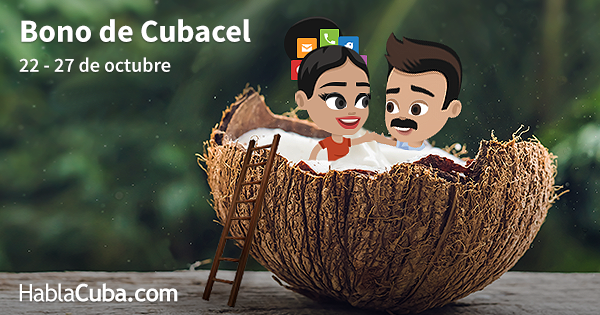 Even if you did, even if you didn’t, Cubacel announced a new promo starting October 22 and ending October 27. Here are the values of the bonuses you send together with your top up. – Customers who have an active bonus from the previous promotion and acquire this new promotion, current bonus will not be accumulated with the previous promotion. – The promotional bonus expires on November 10th or 17th 2018. – The customer receives an SMS prior expiration of the bonus. Main balance’s query can be done through *222# and bonus balance query at *222*266# at no cost for a Cubacel customer. – The money bonus can be used for national and international calls and SMS (includes SMS entumovil). The bonus does not apply to the use of Nauta mail in the mobile, in this case it will be deducted from the main balance. – Bonus cannot be transferred to other Cubacel customers, only the main balance can be transfer. – A customer can receive multiple recharges, as long as it does not exceed the maximum amount established for main account and for the bonus, which is up to 3,000 CUC and 5,000 CUC respectively, if that amount is exceeded the customer will not be able receive more top ups. – Bonus balance is deducted first, then plans and nauta wallet in case having it available and then the main balance. – The received amount shown in the recharge confirmation ticket won’t show the bonus given, however, the mobile phone will receive the promotional balance. – Top ups of 40 CUC or more will be divided into 2 or 3 separate top ups, so that you receive the maximum bonus possible. The recharges may arrive several minutes apart.